I am currently working on cell contour detection with OpenCV. So far, I have been able to detect the cell contours and I want to find and draw the longest axis parallel to the y-axis of the contour. What I did was create a bounding rectangle from the contour which finds the center and the height and width and use this information to draw the axes. As it turns out, the major axis does not necessarily run through the center, so at times it peeks over the cell contour. My line of approach is to split the contour into a semi-circle along the y-axis, aquire the perpendicular distance from each contour point to the y-axis and then select the longest on each side, but I suppose this is computationally expensive. 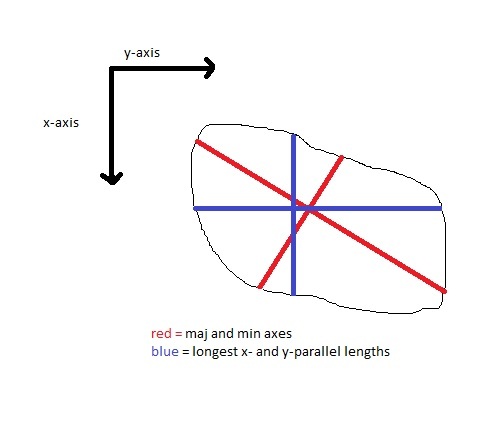 Is there an easy way to find the longest axes of a contour (not a bounding rectangle), that are parallel to the x- or y- coordinate axis? Here's an image - My cell contour is in thin black, major and minor axes are in red, and the blue "axes" are what I want to find. Browse other questions tagged opencv draw axis contour or ask your own question. Why opencv finds the contours' border-points, disordered and uncompleted? openCV Number of contours is double expected?